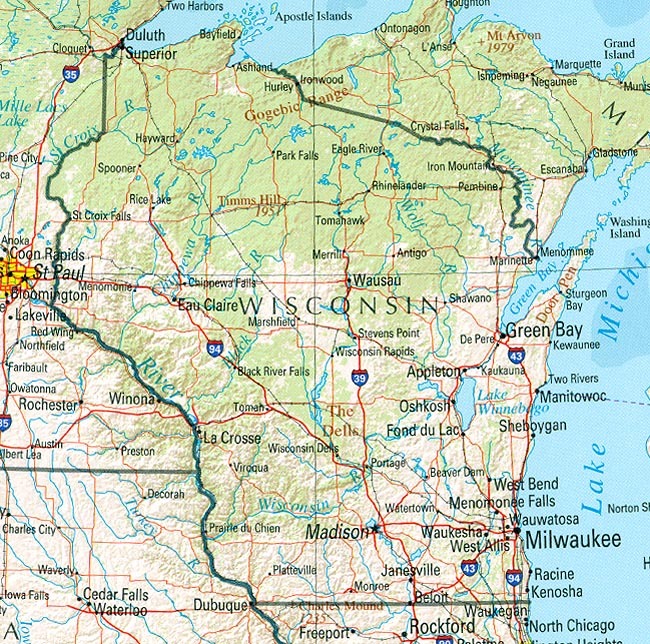 I was drawn up through Wisconsin for my first visit to that state during the west-bound leg of a 6000-mile cross-country road trip last year with Mugsy, my English bulldog, as we leisurely made our way to meet up with family at a lake along the border of Washington and the Idaho panhandle. As we drew closer to the Wisconsin-Illinois border we had a choice of two alternative routes of interest. Satellite radio news from Wisconsin at the time, as it still is today, was all about recall elections. I toyed with veering slightly northeast up through Governor Scott Walker’s hometown of Delavan, now with a renewed reputation as circus capital of the world, then on to see the spectacular new Harley-Davidson Museum in Milwaukee and then five minutes further to the site of the 126-year-old historic Bay View Massacre which occurred during another misguided period of union-busting in that state. But for several reasons related to Durham, North Carolina, where we live and began our journey, I decided instead to cut northwest up through the prairie and savannahs of the western uplands, past the four lakes of Madison (even though we would miss seeing my friend and fellow blogger Bill Geist who was also on the road) and then up through the Dells and across the valley of the 285-mile long Chippewa River. All three reasons for selecting that route relate to passions of mine including the Civil War, the story of trees and family history . Several Wisconsin units had fought with Sherman through the South from Vicksburg to Chattanooga, down across Georgia, up through South Carolina ending in North Carolina and Durham including the 25th Wisconsin which was drawn from counties along the Chippewa. The 25th was part of approximately 80,000 Wisconsinites who fought in the war against slavery and to save the union including 12,000 of whom died. Today, only 46% of Wisconsin is covered by forest but back what would become Wisconsin was 86% covered by forests. As Jefferson Davis paddled his birch bark canoe, the Chippewa River Valley alone held one-sixth of all of the pine timber west of the Appalachians according to the New York Times and 34% of the pinery in what would become the Wisconsin Territory seven years later. Davis swung that ax along the Chippewa three years before US Government-contracted surveyors began detailing the area on maps to be used by timber companies, settlers and speculators as well as portions granted to the railroads. It was also about the year two of my ancestors, Lewis and Elizabeth Neeley migrated north to try to help settle Dane County, Wisconsin several years before Madison was founded there only to find themselves in the middle of the Black Hawk War and were driven south again after the 1832 attack on Fort Blue Mounds, leaving two children buried there. The Neeleys relocated back to Vermillion, IL in 1833, the same year future president Abraham Lincoln volunteered to fight in the Black Hawk War. Eventually the Sac (Sauk) Chief Black Hawk sought refuge along the river with the Chippewa Indians (Ojibwa) where he was persuaded to surrender and was escorted by Lt. Davis to Fort Crawford. For a time, the Neeleys relocated near Vermillion, IL during the time when the Treaty of St. Peters between the U.S. and representatives from various Ojibwa bands which granted full access to exploit the Chippewa River Valley. But the Neeleys had headed west by the time Lincoln arrived to practice law in Vermillion. By 1850, two years after Wisconsin became a state and just as logging was ramping up along the Chippewa, my great-great-great grandfather Lewis, having lost his wife in Winter Quarters, Nebraska, was heading further west still with my great-great grandfather Armenius, up and over the Continental Divide. Logging the Chippewa would intensify after the Civil War as the soldiers of the 25st Wisconsin returned home two years before Laura Ingalls Wilder, author of the Little House series was born along that river, the inspiration for her first book Little House in the Big Woods. The commander of the 25th Wisconsin, Jeremiah McLain Rusk went on to serve in the U.S. Congress then as the governor of Wisconsin when his order to the National Guard led to the tragedy at Bay View. By the 1890s logging along the Chippewa had peaked after a billion feet of logs had been harvested annually through the 1880s. Only 5% of the spectacular White Pines and 0.5% of the Hemlock trees remained. Long before sustainable logging, people with names such as Weyerhaeuser had denuded the Chippewa of 46 billion board feet of timber and by the 1920s the timber companies were trying to sell the barren land to farmers. But once cut over, the land remained “unrehabilitated for generations.” Gradually by World War II the area reforested but not the way it had been. An hour west from Eau Claire WI, where Mugsy and I crossed the Chippewa, and a half hour north off the Interstate as it nears the Wisconsin border with Minnesota is the little town of Clear Lake WI. It is the hometown of the late U.S. Senator Gaylord Nelson, who served two two-year terms as governor of Wisconsin beginning in 1958 before his 18 years in the Senate. Nelson grew up at a period when the devastation left by unsustainable lumbering practices around Clear Lake had left it poor, polluted and denuded compared to what it had been when his grandparents had homesteaded there from Norway in the 1870s. Nelson was a progressive and eventually a Democrat but in the Wisconsin before he returned home from fighting in World War II to practice law he might have easily been a Republican. But progressives were driven out of the Wisconsin Republican Party when La Follette was defeated by the now infamous Joseph McCarthy of 1950s “Red Scare” notoriety when he used extremism and unsubstantiated charges to purge political enemies not dissimilar to the tactics pursued against unions today by Tea Partiers fueling support for Governor Walker. During the early 1960s Nelson was known as the “conservation governor” and the popularity for those initiatives catapulted him to the U.S. Senate where he helped Wisconsin regain credibility on the national stage by founding Earth Day and spearheading conservation legislation throughout the 1970s as part of his fervent advocacy on behalf of small business. The 288 mile detour we took last summer through Wisconsin was enlightening as well as memorable and Mugs and I definitely hope to see more of that state on future trips. And, this time, I hope we can reconnect, my friend. Great post.